VERNON – State Senator Dan Champagne (R-35) and State Representative Tim Ackert (R-8) hosted House and Senate Republican ranking members of the Transportation Committee, State Rep. Laura Devlin and Senator Henri Martin, to discuss legislation proposed by Governor Lamont and legislative Democrats and to present an alternative transportation funding plan that does not rely on tolls or tax increases. 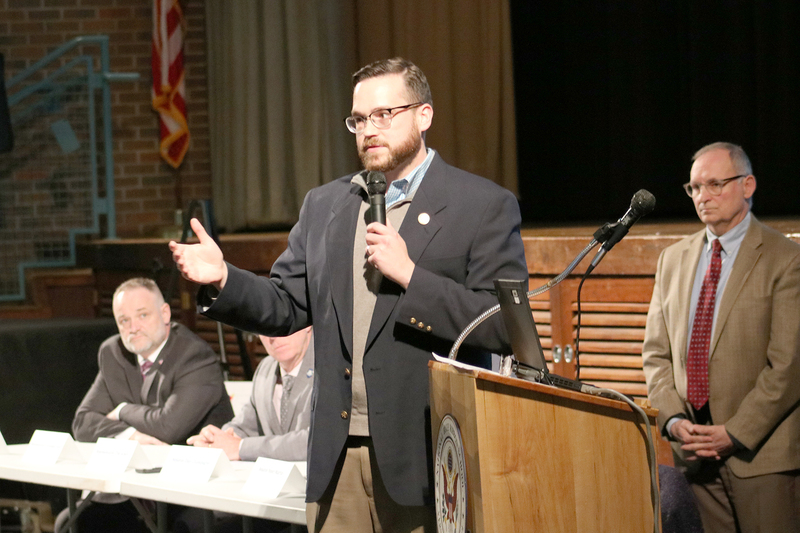 The event held at Vernon Center Middle School on Thursday, April 11th, was co-hosted by State Representatives Chris Davis (R-57) and Kurt Vail (R-52). Saturday April, 27th is National Drug Take Back Day. The Take Back Day is part of the DEA’s National Take Back Initiative to safely dispose of unwanted medications. There are opportunities to dispose of your unwanted medications in East Windsor and Ellington. Studies have shown that drug abuse often starts with family members having access to unused opioids, inadvertently left in the family’s medicine cabinet. Please check your medicine storage areas to see if there are any unused or no longer necessary medications and avail yourself of this opportunity for safe disposal. 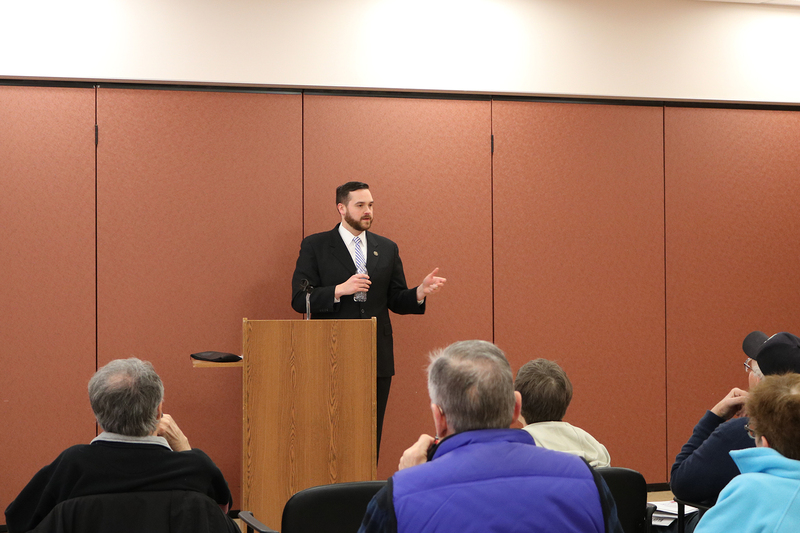 ELLINGTON – State Representative Christopher Davis (R-57) hosted an afternoon legislative update at the Ellington Senior Center on Tuesday, March 19th. 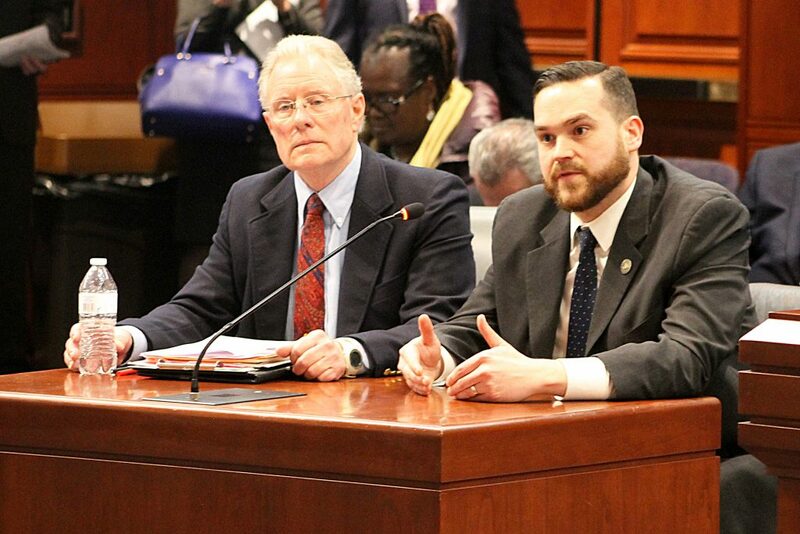 Rep. Davis presented the major issues before the legislature and as Ranking Member of the Finance, Revenue & Bonding Committee detailed Governor Lamont’s proposed budget and tax increases. Residents shared their questions, comments and concerns about the proposed installation of tolls and property tax increases due to unfunded state mandates. 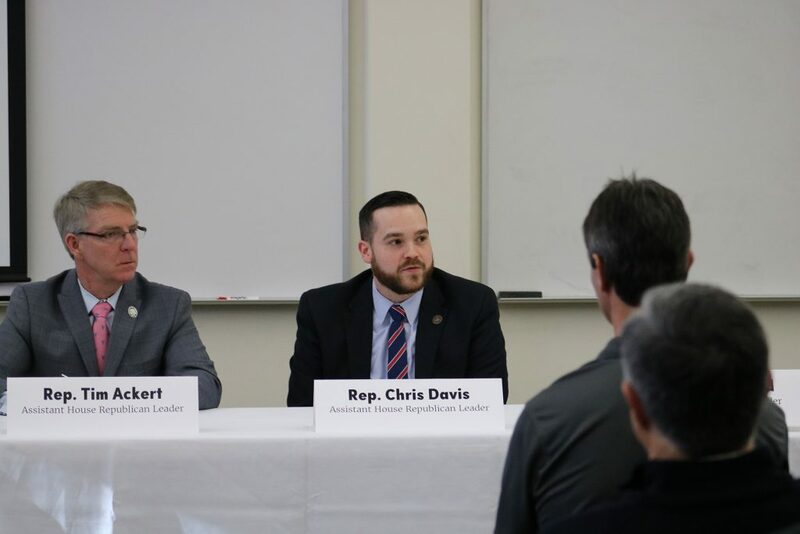 TOLLAND – State Representatives Tim Ackert (R-8) and Christopher Davis (R-57) participated in a panel discussion hosted by the Tolland County Chamber of Commerce co-sponsored by the CBIA held at CNC Software in Tolland. HARTFORD – State Representative Christopher Davis (R-57) and Ellington Public Schools Superintendent Dr. Scott V. Nicol testified in support of HB 7258 ‘An Act Concerning the Establishment of a Firm Graduation Date and the Date for the First Day of School Sessions’ before the legislature’s Education Committee on Wednesday, March 6th. 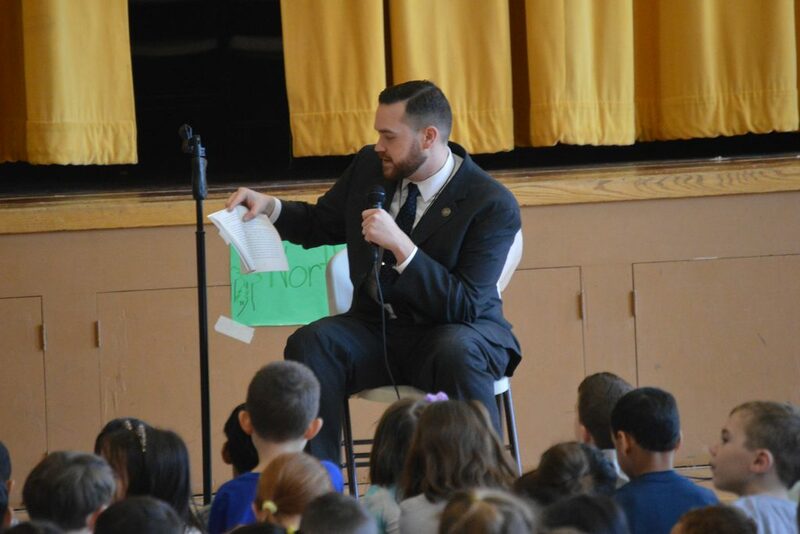 State Representative Christopher Davis (R-57) celebrated Read Across America Day at Broad Brook School on Tuesday, February 26th and Center Elementary School in Ellington on Friday, March 1st. Because the issues of crumbling foundations are critical to our community, I am writing to let you know that the Insurance and Real Estate Committee and the Planning and Development Committee will be holding an important public hearing on Friday, March 8th, at 1:00 p.m. in room 2E of the Legislative Office Building in Hartford. 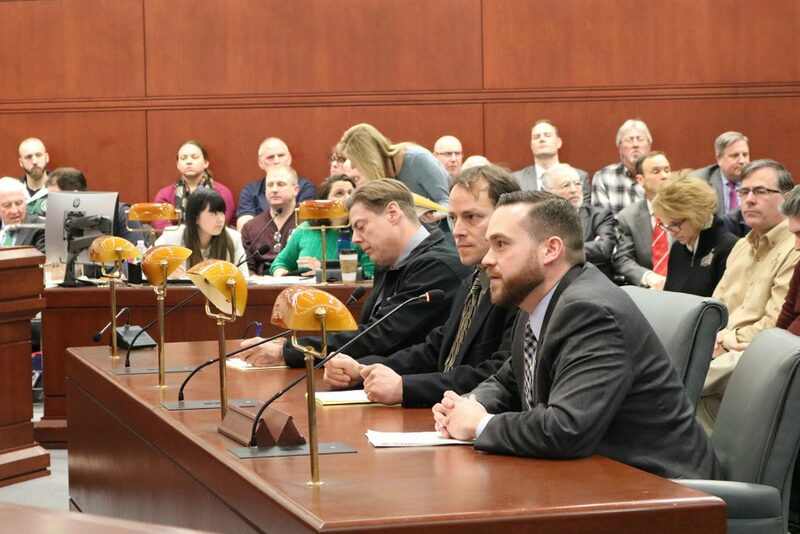 HARTFORD – State Representative Christopher Davis (R-57) joined Rich Gummoe and Kevin West, the owners of Nordic Moon Meadery in Ellington to testify in support of Section 8 of HB 7184 ‘An Act Concerning the Liquor Control Act’ before the General Law Committee on Thursday, February 28th. HARTFORD – State Representative Christopher Davis (R-57) and East Windsor First Selectman Robert Maynard testified before the Public Safety and Security Committee in support of SB 11 ‘An Act Concerning the Authorization of a Casino Gaming Facility in East Windsor’ on Tuesday, February 26th.